Up to 16 channels of independent control! 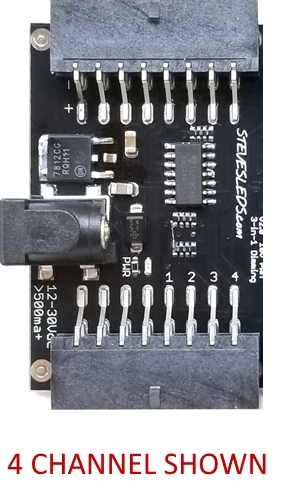 This is a universal signal converter, specifically designed to get most available LED controllers to control Meanwell drivers that have 3-in-1 dimming capabilities. This is compatible with Bluefish as well as HurricaneX controllers. This is relatively simple to install, just supply a 12V source, like this power adapter. (No soldering!) Then you can attach the input to your controller, and the output to your drivers. Please be aware that this does not allow Meanwell 3-in-1 dimming drivers to turn completely off. This issue is not a limitation of this converter, it is a limitation of the driver. This issue is indicated in your driver's datasheet. We recommend plugging your driver in to an inexpensive (~$5USD) wall timer to turn off after sunset has completed, and turn on before sunrise starts). Easiest solution ever! Beware, using an external relay such as indicated in the Meanwell documentation can not only be a fire hazard, it is not suitable for commercial installations as it not safety certified, whereas a wall timer would be UL safety certified. 4 or 16 channels of independent control, depending on the option you select! I'm using this to control 10 meanwell HLG drivers. The details on what all the harnesses are are in the "Expert Info" tab. I got the 16 channel harness for future expansion. Works great, especially with the wall timer trick in the description. Side note- the previous version 1.0 did NOT work properly with HLG's. This version 2 DOES work with HLG's perfectly! Power - Can be supplied by a separate 12V > 500ma power adapter or a HurricaneX V5.0S (verify firmware version in settings). Actual consumption is typically under 1W. 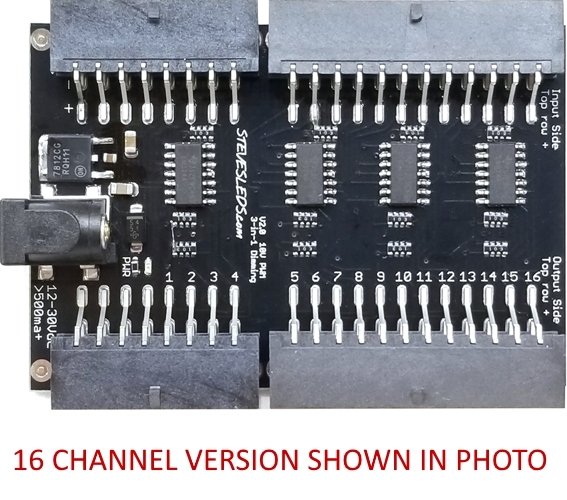 Number of drivers per channel - We have tested up to 20 drivers per channel with no sign of signal fatigue. We are confident you can plug dozens of drivers into a single channel. Optional Connectors - 4 channel version comes with a wiring harness for 4 channels, and the 5-16 channel adapter opens up 12 more channels! This is because most people only need 2-4 channels, so why pay for the extra channels you won't be using? 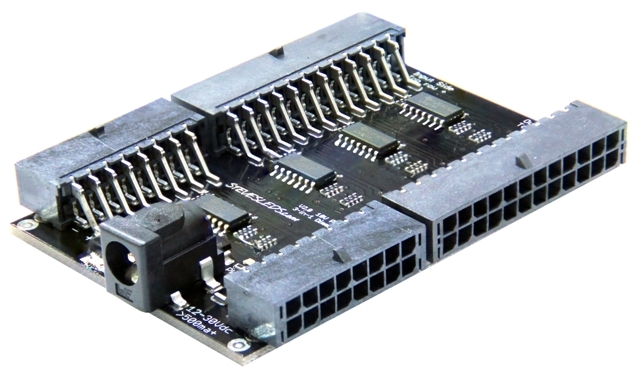 Hardware - Very durable, robust hardware with circuit protection. That means it can usually tolerate a miswire without damage. Dimming Resolution - Ultra fine. Can support 5,000 steps of dimming, where human eyes can only detect about 700 steps of dimming. Supported Drivers - Any Meanwell driver that supports either 10V PWM or 3-in-1 dimming, including the HLG series! This is the solution most people with HLG drivers have been waiting for. An easy solution to get these drivers to dim with an off the shelf budget level controller. Works with all Meanwell drivers supporting 10V PWM or 3-in-1 dimming! Bear in mind that this device uses robust connectors - not cheapo connectors that stop working after a few insertions. These are designed to last 20 years. This means you'll need the appropriate plug that goes into these connectors. At first glance they seem a bit expensive, however we are selling these at near cost as a service to our customers because they are insanely expensive to make. If you have a HurricaneX, to find your version number, just long press to enter the menu and scroll all the way to the bottom - there it is! If you are ordering a new HurricaneX controller with this converter, then no worries, we will automatically get you V5.0S! *These allow for 4 fully independent channels, with bare wire leads on them. You can solder to them directly or use our Quick Splicers (link at the bottom of the page). Don't forget the power adapter! *If you have a V5.0S, it will provide a direct connection to the HurricaneX's first 4 channels and provide power as well! No power adapter needed. *If you checked your version number, and it says something like V4.7 or V5.0RSM, then choose this option. Don't forget the power adapter! *If you have a V5.0S, it will provide direct connection to the HurricaneX's first 4 channels and provide power as well! No power adapter needed.